1-bedroom tiny house in the country–15 minutes from Magnolia and Baylor! This elegant tiny home is perfect for a weekend getaway and is comfortably furnished for a cozy vacation. Sleeps 2 adults in the queen size bed in the loft but could sleep 1 or 2 children in the "lounge" loft if desired. 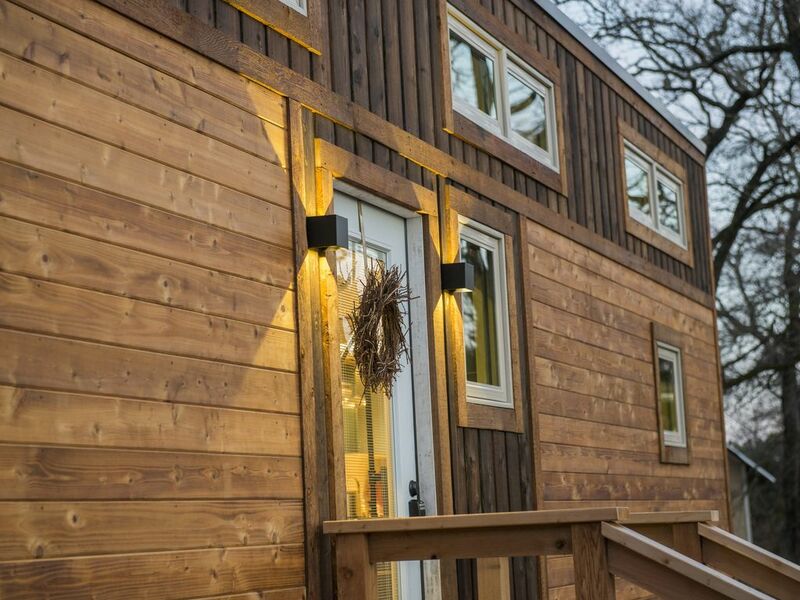 With a full kitchen and bathroom, this tiny home feels much larger than it's 325 sq. ft. If you've seen the tiny house shows on TV and have wondered what it's like to live in one, here's your chance! Just 15 minutes from Magnolia and Baylor! This beautiful 325 square foot tiny home features handmade Shou Sugi Ban cedar siding and solid pine tongue and groove interior paneling. Built on a custom-made trailer, it boasts oak flooring, solid maple countertops, custom kitchen cabinets and handwoven Roman shades. The bathroom sports a full-size tile shower stall and a waterless toilet. The insulated vinyl windows are all casement-style allowing for full ventilation even with their small size. The concealed fastener metal roof completes the outside of this spectacular tiny home and will last for decades. A propane tankless hot water heater, minisplit air conditioner with heat pump, catalytic propane heater and washing machine hookups complete the utilities on this functional home. Kitchen appliances include a propane range/oven and an efficient electric refrigerator/freezer. Spray foam insulation, LED lights throughout and insulated, low-E glass windows contribute to making the house incredibly energy efficient. With the EcoWheeler solar and wind power plant, this house runs completely off grid. Great stay in this well appointed and very comfortable tiny house. Located in a peaceful setting but close to amenities. We really enjoyed our stay. Perfect retreat! Tiny house has everything you would ever need and then some! Very welcoming and accommodating! Very clean with wonderful amenities. Location was also perfect for a Waco getaway! It was fantastic. Bigger than it seems. Very comfortable. Very clean. Good area. Highly recommend it. Unique features. property was nice. My kids are begging to come stay after hearing about our trip!